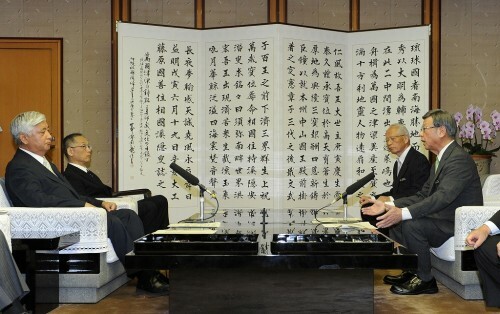 Governor Takeshi Onaga (right) and Defense Minister Gen Nakatani (left) had their first meeting on May 9 at the prefectural government office. Onaga criticized the central government for its stance that ‘Henoko is the only solution.’ “Okinawa is gasping and suffering. This is why Okinawa has strongly claimed the right to self-determination in this case,” the governor said. He asked the defense minister to respect the wishes of the Okinawan people. The meeting lasted about 40 minutes. The first part of it, for about 20 minutes, was opened to media. The Okinawa Prefectural Government (OPG) has asked for permission to enter a restricted area of water off Henoko but the U.S. military and the central government have refused. The OPG plans to carry out a survey there to investigate how corals have been damaged by concrete blocks installed by the Okinawa Defense Bureau. The governor again urged the defense minister to respond to the request from the OPG. Onaga also criticized remarks the defense minister made at a press conference in March. Nakatani said that if meeting with the governor deepened the conflict between the prefectural and national authorities, it would be meaningless. The defense minister also has said that the governor should think more about Okinawa’s and Japan’s security. Onaga quoted a remark made by an LDP lawmaker, a then-member of the House of Councillors Budget Committee, who visited Okinawa in 2013. The lawmaker said “It is natural that the Okinawan people host U.S. military bases, because the people in mainland of Japan hate them.” Onaga said, “I felt a sense of hopelessness when I heard that remark.” The governor pointed out that a lack of understanding by people from outside the prefecture had led to an excessive burden on Okinawans. The government has made a commitment to the former Governor Hirokazu Nakaima that ‘U.S. military operations at the Futenma base will stop within five years’. Nakaima approved the landfill application from the central government in 2013, based on such a verbal promise from the prime minister. Nakatani has described the government’s commitment as meaning ‘a state whereby no aircraft fly.’ However, he later withdrew this definition, saying that he should not say things that may mislead people. Onaga asked the defense minister to keep the promise to the former governor.